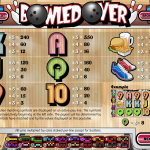 Bowled Over is a 5 reel / 20 paylines slot game released in 2010 by Rival. The name already suggests that this is about bowling and this is exactly what it is. You get a pretty classy vibe from this game like the one you see at those old bowling alleys from the 50’s. The Wild in this game is the Bowling Pin symbol which will substitute other symbol to create a winning combination. It appears only on reels 1 & 2 and will expand if it helps you complete a combination. There are also two scatters here. The first one is the Lady Bowler symbol. Landing 3, 4 or 5 anywhere on the reels will reward you with 10, 20 and 40 Free Spins respectively with a 2x multiplier. The second scatter is the Bowling Ball symbol. Landing 3 or more will trigger the Bonus Round in which you’ll be throwing the bowling ball at the pins. Obviously a Strike will get you the highest prize and a Spare a bit less. 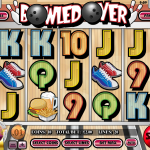 Overall Bowled Over is a fun game where the bonus round is really the highlight. The graphics are a bit dated so if this is important to you you might want to look elsewhere. The RTP for this game stands at 94.5%. Ever thought of going on a cruise? 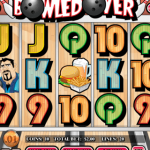 then the next one might be for you: Baby Boomers: Cash Cruise a 5 reel slot by Rival.